Sightseeing in Niederbayern - what is better than the airfield Straubing Wallmühle. 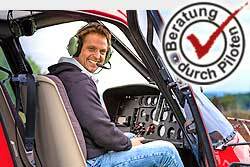 Enjoy a 20 or 30 minute helicopter flight and explore the various regions from the bird's eye view. Regensburg, Deggendorf, the Bavarian Forest or Landau / Dingolfing are possible. We are pleased to advise you personally about our free number 0800 0700 130.